Although the System i servers rate over a 99.9% availability factor, there are times when problems occur. Some problems limit the use of a device, program, or application. More severe and pervasive problems limit the use of more components. In either circumstance, the amount of time a component is unavailable relates directly to the actions taken to manage the situation. The ability to resolve problems depends on the tools that are available, the knowledge (and attitude) of the worker, the symptoms and nature of the problem at hand, and other factors. 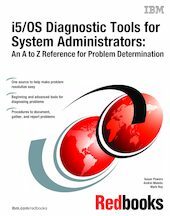 This book is designed to introduce you to the problem determination aids used in an i5/OS® environment. You can become familiar with the tools that are available and the instructions for how each one works. As proficiency is built with the use of each tool and familiarity with the procedures, efficiency of the system operator and service personnel increases. Consider this book a “Don’t Panic, Read Me First” guide to help you support System i models. It discusses problem analysis, problem determination, and problem source identification. And it offers you step-by-step instructions that show you how to use the i5/OS problem determination aids to produce detailed problem information.